Santa Fe, New Mexico, fondly referred to as the "City Different", lies in the foothills of the Rocky Mountains at an altitude of 7,000 feet. America's oldest capital city, Santa Fe is rich in culture and has an extensive heritage. Visitors will immediately feel Santa Fe's timelessness as they behold the preservation of its historic buildings, view the distinct Spanish-Pueblo style of architecture, hear the Spanish language spoken here and witness the Native American influences in the arts. Santa Fe is one of the country's most diverse and fascinating cities. It is a popular vacation destination for tourists drawn to the abundance of cultural attractions including Native Amaerican festivals, museums, art galleries, opera, and over 200 restaurants. Santa Fe is also a favorite getaway choice of outdoor enthusiasts. The Sangre de Christo mountains provide many hiking trails and offer excellent skiing. The Rio Grande hosts white water rafting and fishing. With over 300 days of sunshine, the weather remains clear and primarily VFR for aviators. 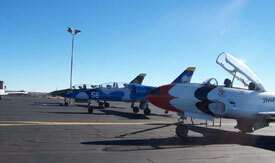 Santa Fe is a great place for flight training. We are located at the Santa Fe Municipal Airport. The airport has an 8,350 foot runway, two 6,000 foor runways, a VFR tower, and a practice area only eight miles away. We are located Southeast of and adjacent to the tower at the "Santa Fe Air Center," a full service FBO with many amenities and excellent customer service. All Jet Warbird customers can make one phone call to the Santa Fe Air Center (505-471-2525) and have a car and hotel accomodations promptly arranged. Hotels are either downtown (20 minutes away) or nearby (5 minutes away). While you can fly a commercial airline into Santa Fe, we recommend flying into Albuquerque and renting a car there. The drive is only 45 minutes. When not flying, Jet Warbird customers and their guests can also arrange personal, guided tours by contacting our concierge, Lee, at 505-670-9030.